President Donald Trump's Supreme Court nominee, Brett Kavanaugh, listens to a question on the third day of his Senate Judiciary Committee confirmation hearing on Capitol Hill in Washington to replace retired Justice Anthony Kennedy, Sept. 6, 2018. I tried to pay attention to what Judge Brett Kavanaugh was saying during the hearings last week. For anyone as addicted to the Supreme Court as I am, a nomination hearing is more exciting than the return of Halley’s Comet, and only slightly more common. This was one of the major reasons that I was disappointed by the Senate’s refusal to give Merrick Garland a fair hearing in 2016, along with the fact that it was petulant, mean-spirited, partisan and on the razor-thin edge of unconstitutional. But I’ve moved on, even if the Democrats haven’t. That became very clear the moment the gavel came down on Sept. 4. 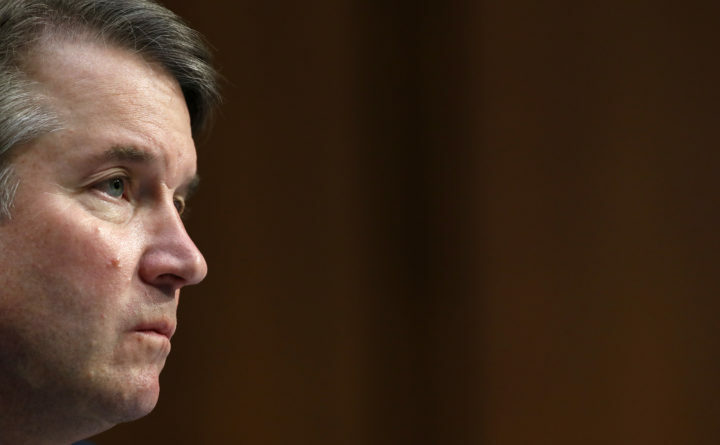 Before the nominee even had a chance to say, “My name is Brett, and I’m a judicial conservative,” a band of screaming banshees filled the air with their guttural, desperate whelps. Oh, no, I thought, did an itinerant group of Women’s March alums get lost on their way to Pat Toomey’s office? And the reason he’ll be confirmed is because Harry Reid decided to invoke the nuclear option back in 2013, when he ruled the Senate, and Democrats were in the majority. Angered by what he saw as GOP obstructionism in refusing to confirm President Barack Obama’s lower court picks, Reid decided to go all Hiroshima on his colleagues and eliminate the 60-vote supermajority that was once necessary to confirm federal judicial nominees. Now, only a simple majority of one vote is needed. And that useful filibuster? It’s as dead as Kellyanne Conway’s chance of being hired as the newest panelist on “The View,” or Sarah Huckabee Sanders’ chance of getting any meal but takeout. The protesters know this. They almost make you feel sorry for them with their hand-painted signs, their defiant chants, their cute little “Handmaid’s Tale” get-ups and their Chicken Little warnings. You want to tell them that it will be OK, that it’s possible to survive even when you feel as if your civil rights are being violated, and that adversity makes you stronger. We in the pro-life movement have been getting stronger every day for the past 45 years. Now it’s time for the other side to enjoy that same sense of exhilaration as you fight against laws that violate your sense of humanity. Because even though I didn’t get to hear much of Kavanaugh’s comments on Roe v. Wade, I heard enough to convince me that he’s not as impressed with that “super-precedent” as the late, great Arlen Specter. Kavanaugh made all the right rhetorical concessions, but it’s pretty clear that if the opportunity presents itself, he will vote to overturn our generation’s Dred Scott precedent is only binding on the people who don’t make it. And Kavanaugh is interviewing for a job that will put him squarely in the position of making it. The screamers know this. There are reasons to wish that this nomination process was cleaner, fairer, not so rushed. And the spirit of Garland, ironically a good friend of Kavanaugh, hangs over the proceedings. I can’t deny there’s a slightly bitter taste in my mouth. But then I see the crazy people exercising their First Amendment rights and all that matters is the prospect of getting one vote closer to overturning Roe.